By Matthias Steiert, Ph.D., Elanna Mariniello, B.A., and Afaf Steiert, M.Sc. Nowadays, clinical trials are governed by strict guidelines, a declaration outlining standardized ethical practices, mountains of paperwork, a heavy review process, and the ability to affect a multibillion dollar pharmaceutical industry. Every new drug must go through a clinical trial, Patient Reported Outcomes (PROs) must be evaluated, and the drug deemed safe for humans to consume and doctors to prescribe. The failure to do so within the ethical and specified guidelines could result in serious health risks, including patient fatality. Thus, designing and implementing a well-designed clinical trial is critical. There are, indeed, clinical trials that take place in their country of origin; however, in recent years clinical trials have become an increasingly global affair, and the trend to delocalize clinical trials into emerging countries continues. Both translation and localization services are necessary to accurately represent the implementation and outcomes of these trials. Many times, clinical trial protocols (CTPs) are developed in one country and then implemented in locations with vastly differing languages and cultures. The importance of clinical translators thus becomes a key element in the implementation of these trials and the way pharmaceutical companies interpret PROs. Although the consequences of an inaccurate translation can be extremely serious in terms of human lives, credibility, and economic revenues, translation is often the last step in the planning of an international clinical trial, and it is rarely given the attention that it requires. Faulty translations may entail the “failure of the participant to act as instructed, disparities in prescription and administration of the study preparation, and reduced likelihood for appropriate followup and treatment of the underlying conditions and/or of side effects of the trial,” (Eldar and Wexler 2009: 15), not to mention physical or emotional damage, misconduct of the experiment, time, and money. The obligation to translate clinical trialrelated documents varies from country to country. In the United States, all documentation for all participants and investigators must be in the local language. In other countries, it is often taken for granted that most researchers are able to read and write English, and this is one of the reasons why it is not compulsory to translate the texts specifically addressed to them, even though most regulatory bodies and ethics committees still require local language documents to be submitted for review and approval. With differing worldwide clinical trial regulations, some trials are conducted without being completely translated, sometimes even as a way to shorten the time before approval and reduce costs, to the detriment of the outcome. Since translation needs to be involved at many stages, from clinical research and regulatory submission and review to production and marketing, improving the quality of the translation services can actually reduce timelines and even save money. The role of translation in affecting the likelihood of lawsuits or rejection by regulators and in the safety and efficiency of the final product should not be underrated either. Every clinical trial requires a protocol, which assists communication among all individuals in the trial. Each protocol describes the objectives, design, methods, statistical aspects, and organization of a trial. Clinical trial protocols are formal, written documents of a very specialized nature which show a high degree of technical complexity and require a clear, concise, and accurate style so that any ambiguity can be prevented. The language used in CTPs is becoming more and more differentiated, as it blends medical, administrative, and technical jargon (for instance, statistical terms), and it involves many traits which are not seen in other medical documents. Thus, terminology from any field of medicine mingles with that from laboratory practice and from the Medical Dictionary of Drug Regulatory Activities or MedDRA (Maintenance and Support Services Organization, 2011) and is very often unique to every individual trial. However, not all documents related to clinical trials involve highly technical content, and the recipients of the translation must be taken into account. Clinical trial documentation producers and translators must be aware of the fact that each participant is supposed to have a different level of understanding of the development and use procedures of clinical trial-related documentation, which is best illustrated if we compare that of participants and the specific site researchers. For instance, in order to standardize the conduct of the trial and to facilitate communication between all the individuals involved, several types of instructions, which may be placed in an appendix or in the data collection forms, can be created. In addition, informed consent forms record dated and signed decisions to take part in a clinical trial, which are freely undertaken by individuals once they have been informed of its nature and risks. These documents must be easily understood by study participants. Create translation memory. Source materials, existing translations and translation memories, glossaries, and public databases are used to compile a translation memory. Create a terminology base from the translation memory. Translate, edit, and proof first round of translation. Today’s pharmaceutical companies need more and more services that go beyond simple translation and enter the realm of localization, that is, the modification of a product or a service to account for differences in different countries, markets, or locales. Outsourcing to localization and globalization service providers has been a strategic decision, so that pharma companies could remain focused on their core businesses. Involving not only linguistic transfer but also content, cultural, and technical issues, localization accounts for changes in information, functionality, instrument design, and all necessary aspects in an organized manner, thus facilitating quality assurance and control . This is particularly the case when it comes to trials being conducted in emerging and culturally distant countries in Asia, Africa, Eastern Europe, or Latin America. In recent years, pharmaceutical companies have begun to contract language service providers not just for translation, but for all language and globalization needs in the form of consulting services with reference to regional regulatory requirements, interpreting services, asking experts as technology advisors, etc.. When translation is taken into consideration from the beginning of a study, it is more likely that all resources can be more efficiently assigned, delays can be avoided, and the documentation provided will be readily understood within the cultural context. It has been stated that the quality of the translation of clinical trialrelated documentation is rather poor nowadays; this is perhaps the case because of the relatively short time frame given to translators in which they must complete their work. It may also be due to the fact that the rare combination of professional translation skills and biomedical knowledge is not very common among professional translators, or alternatively, because the needs of the target reader of the translated document are not sufficiently taken into consideration. A sound review process once the translation is complete can take as long as 7 to 15 weeks, while providing reviewers with online tools or even outsourcing the review to an independent third party could improve this situation. Cultural values and behavior may present benefits and/or challenges for the sponsors of multinational clinical trials with respect to management of relationships with subjects, investigators, and regulatory bodies. As for the benefits, some cultures, such as Japan and Russia, are “cultures of compliance” and participants belonging to them tend to follow doctors’ instructions to the letter. However, that very same trait can become a challenge when they do not easily complain or report adverse events. Undeniably, accurate translation of study documents by native speakers from each country or locale plays an important role in the success of trials in any particular region. With so many different steps to be completed by so many different team members, validation of CTPs and PROs may take months. For clinical trials where a cognitive review workflow is necessary, delays can seem endless. The worst possible outcome of a poor translation process is a serious adverse event. More common is the expensive price of delay. As regulatory bodies demand greater scrutiny over drug discovery and clinical trials, costs and risks will increase. As sponsors and CROs look for efficiency wherever they can find it, clinical trial language management offers a key competitive advantage. As trials become more global, sponsors and CROs that can rapidly deliver good data will enjoy a market advantage. 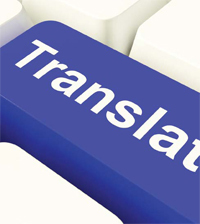 Translation best practice is critical to the effort of cultural consulting, cultural adaptation, and localization.